Enviroflex® is a fiber reinforced articulated concrete block for erosion control and scour protection. Following Soil Retention’s philosophy of performance of product and overall system instead of pure ease of manufacturing, Enviroflex® is cast as a tapered and vertically interlocking block (hard to make but very effective). Some flood control designers and major dam hydraulic engineers demand a tapered block feature that limits or eliminates block to block protrusion in the direction of flow. The vertical interlock (tongue and grove design) and tapered design of Enviroflex® results in a very safe and low maintenance alternative to rip rap, cast concrete, and other traditional methods of erosion and scour protection. Detention basins are often large relatively natural looking spaces within new developments. Some designs and agency approvals require emergency spillways for redundancy in major design storm events. Should the basin fill up and overtop due to a series of significant storm events, there must be a protected spillway in case of potential overtopping. Using Enviroflex® in this application allows a plantable, permeable, and overall a more aesthetically pleasing solution than rip rap or cast concrete slope paving. 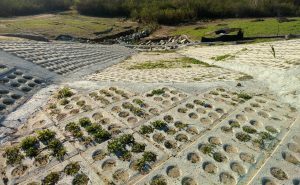 Installed cost of Enviroflex® is about the same as a traditional cast concrete spillway but offers easier agency approval due to permeability and ability to sustain vegetation. It can also help mitigate downstream impacts due to a rougher surface than cast concrete and reduced runoff due to permeability. Sedimentation basins are very common due to storm water regulations to mitigate impacts from our built environment. New roadways and developments that add a lot of impervious area increase water runoff and can result in erosive waters that carry sediment. The excess runoff carrying sediment is not allowed to be discharged directly into streams, rivers, and lakes because it is not recognized as a natural process. 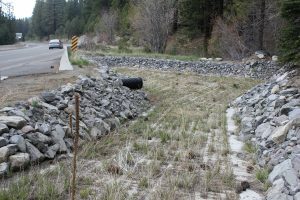 Nevada Department of Transportation (NDOT), for example, uses sedimentation basins as a best management practice to comply with storm water regulations for new road improvements. These basins were first lined with rip rap to protect against erosion from major storm discharges. However, maintenance crews refused to maintain these basins because driving, finding the true bottom, and even walking on rip rap can be very difficult. Today, NDOT specifies cellular erosion control blocks for the bottoms of these basins if there is an expectation for maintenance. A fiber reinforced, tapered and vertically interlocking system like Enviroflex® is considered superior with the ability to allow minor cracking and not allowing the blocks to shift relative to each other. Most other products on the market have no vertical interlock, are not cast with fiber reinforcement, and require cables for true articulation. Similar to pavers, subgrade strength and vehicular load should be considered by the designer for these applications. The rail road is expanding with new routes and turning old single lines into double tracks. Per the NPDES, even the railroad has to take care of the additional runoff caused by these improvements. 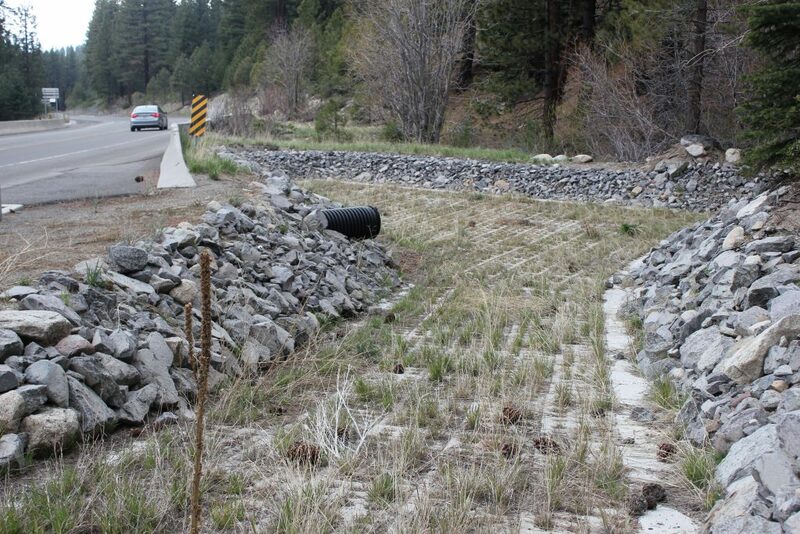 Once impervious cast concrete ditches have turned into products such as Enviroflex® to mitigate runoff. 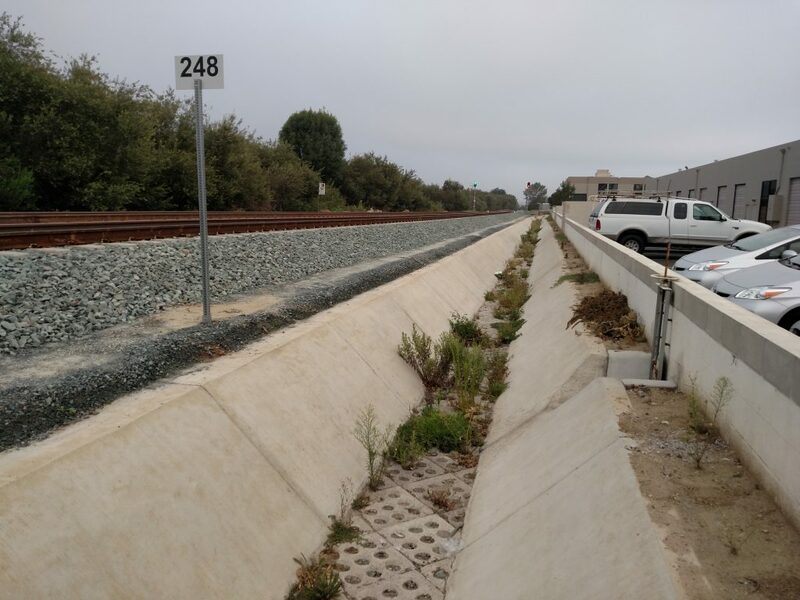 Local SANDAG projects have used Enviroflex® for permeable drainage ditches and bridge abutment embankment protection.